Web designers and developers will never get tired of tracking the latest trends as keeping up the pace is vital for their work. Want your business vessel to stay afloat for ages? Be aware of the slightest fluctuations in your niche. This will help you run a mile ahead of the competitors. Unfortunately, sometimes web professionals lack time to collect bits of the relevant information scattered all over the Internet to put all pieces of the puzzle together and get the whole picture. The guys from MonsterPost took care of that issue. They have browsed nearly 70 articles (the reading took 3 days!) 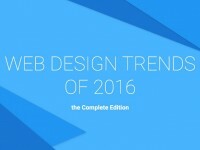 to list all major website design trends of 2016. We guess this is a good reason to look through their digest instead of spending long hours surfing the endless Internet spaces yourself. They even made a kind of article plan to make the information easier to digest. Each item of the plan is an anchor in the original blog post, so you may just click and skip to the paragraph that is essential for you at the moment and leave the rest ones to study later, when you’ll have more time or desire. If you want to check 2016 website layout standards, click the relevant link and cast an eye over the story. If you want to make sure that your imagery is trendy, click the ‘imagery’ link and so on. BTW, some trends popular in 2015 are also included into the digest as they are spinning their wheels to reach the peak of fame in 2016. In short, the author of the article have summarized, systemized and set into order all the available material on 2016 website design trends, so after reading it you will be able to surprise your colleagues with deep knowledge and understanding of the matter.